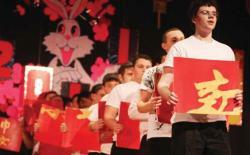 Chinese language students from Saint John&apos;s High School perform songs and dances at the Feb. 13 Chinese New Year celebration at Oak Middle School in Shrewsbury. About 100 students representing Mrs. Ann Shi&apos;s and Mrs. Haihong Li&apos;s Chinese language classes, from freshmen through seniors, danced and sang at the Spring Festival at Oak Middle School. Saint John&apos;s senior Dhruv Srinivasachar served as master of ceremonies, along with Mark Xu from Shrewsbury High School. Srinivasachar also performed a comedic monologue in Chinese.